Demonoid uses username to log into a user account so if you remember your username than it is easy to log into Demonoid, just type the username and password into its login form. If you have lost your password then just click on "lost pass?" link and on the next screen just enter username and email ID, then you will receive an email with a link to reset password. This for those visitors who know they registered on Demonoid but after a span of 2 years cannot remember the login details. 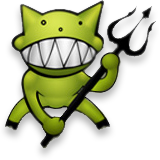 Demonoid after their resurrection received lots of requests that the users forgot or didn't remember their usernames, as a solution to that request Demonoid released a new form to recover usernames. So, to recover your username visit Forgotten username page and add you email ID in the form and press submit. On the next page you will see your username using that you can login into Demonoid. I hope this might have helped in getting back to Demonoid, now that The Pirate Bay (TBP) is once again offline and no signs of its resurrections are there. Some of Greatest Brand Names on the Net. Where Do these Come From ?